The Juan Lopez Seleccion No.1 is a rich and tasty medium Habanos of Grand Corona format, 5.6” (143mm) long, of 46 ring gauge, and comes in a 25 cigars box. 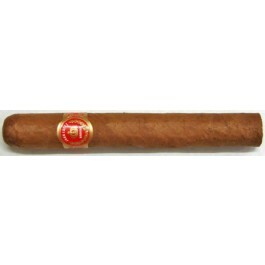 The Juan Lopez brand is one the oldest founded in Cuba, in 1876. Released in 1990s, it is fully hand-made with Vuelta Abajo filler leaves. It can be sometimes hard to find, as the production can be interrupted at times, due to high quality standards. It is a Corona Gorda format, an extraordinary compromise between a Churchill, a Hermoso No.4 and a Corona. It is full of flavors; the aromas are well balanced between woodsy, earthy, sweet and peppery aromas and some creaminess to bind it all. The texture of the Juan Lopez Seleccion No.1 is amazing, generates lots of creamy smoke and an amazing taste. It can be both enjoyed young and fresh or with some more age and would delight both the beginner and the cigar aficionado. In short, a very impressive smoke by a lesson-known Cuban brand. • A very Cuban character with deep flavors of cedar, hay and lots of pepper. • A smoke that would please both a new comer to Cuban cigars and a cigar aficionado. A cigar that ages very well. The Seleccion No1 is a nice looking cigar, fully hand rolled, giving it a rustic look. The wrapper is of medium brown, colorado claro, color and is a bit veiny, but that doesn’t affect the quality of the smoke at all. It also has a well-applied triple cap with an exceptional flat head. In your hand, the cigar feels nice and light, and the cigar is firm to the touch despite couple of soft spots. Indeed, the cigar is very well constructed and well bunched despite few slight bumps in under the wrapper. In terms of fragrance of the cigar itself, there is a pleasant scent of light toasty tobacco, also some aroma of sweet graham cracker. The pre-light draw is full of Cuban cedar and earthy flavors. However, those flavors are not too overwhelming and leave ample place for some fresh aromas, almost of citrus, floral and grassy notes, and wonderful hints of cinnamon. There is also a nice touch of spiciness on the lips, which is counterbalancing the straightforward tastes of tobacco and leather. To make things even more exciting, there is also a subtle sweetness on the cold draw, with touches of honey, dried fruits and of milk chocolate. Once cut, the draw of the Juan Lopez Selection No.1 was very clear and regular throughout the whole cigar, but not too easy though, just the right amount of resistance. The burn line can be uneven at the beginning, however, few puffs down the line, the burn is steady and even. The ash holds on firmly and has a nice medium-dark gray color. The stogie creates a generous amount of smoke right from the start and didn’t need any relights. In the first third, the cigar is dominated by woodsy flavors of Cuban cedar, dry and sharp, a bit sour, but they are not too overwhelming and leave some space for many more flavors. The cigar is rather mellow for now; we can detect a slight light toast flavor, also some creaminess of butterscotch, as well as of sugar, honey and citrus notes. There is a nice floral profile to it, with some grassiness on the finish and some pleasant aromas of dry hay as well. Slowly, the cigar picks up in strength, a medium bodied cigar, accompanied by a good amount of black and white pepper. The spicy profile of the Selection No 1 prefigures what will be the cigar about in the second third. Indeed, in the second third, the smoke becomes slightly more robust, drier in a way, the mellowness disappears and leaves ample place for more woodiness and more earthy tastes. The floral notes are very discreet at this point, it’s an improvement in my opinion, but the flavors of toast and butterscotch are more pronounced –deeper. This third is really beautiful; the retrohale smoke is more pronounced, exhaling some more grassiness. In the last third, the flavor profile doesn’t change much, but the strength of the cigar is kicking up a notch. Still the dry woody flavors, with some more spice, coming from cinnamon, and the stogie picks up in intensity. The toasty and sweet flavors are fading away, while grassy aromas are strengthening. Somehow, the cigar is a bit creamier towards the end, despite increase in strength of the cigar and the musky character of it. In summary, this cigar delivered. It was a very well balanced and a very enjoyable smoke. This is a heady smoke that would go very well with some liquor. It is a smoke that both cigar aficionados and beginners can enjoy, thanks to its rich, mighty flavors as well as its complex structure that releases a good amount of creaminess. This is one of those cigars that benefits from some aging - 3 years at minimum – 10 recommended.